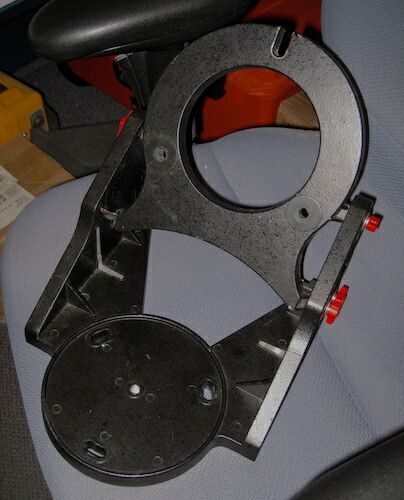 When I was putting this telescope system together the only equatorial wedge that I had to go between the tripod and the telescope forks was a "standard" Celestron wedge that I got from Colorado with the HD tripod. This was the same model of wedge that I had for my 1979 C8. 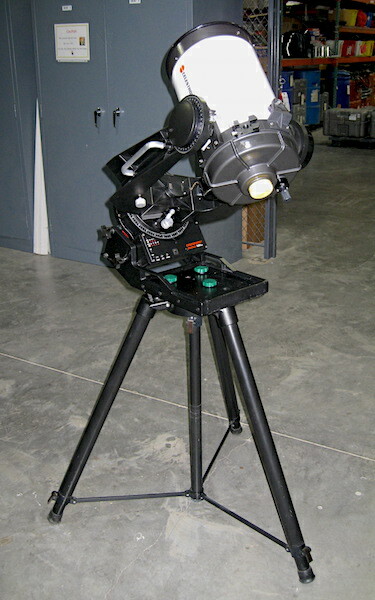 It looked a little inadequate between the Ultima/HD tripod and the Ultima set of forks. 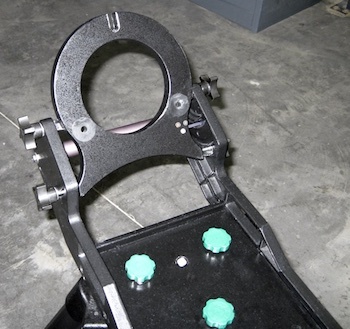 I even had to have two of the gussets carved out of the way to allow the telescope forks to be tilted back far enough to get the mount polar aligned (34° lat.). Cleary this wasn't the right wedge for the job, but it served it's purpose well enough. Good things come to those who wait and spend money. While I was getting the scope Sedona back together up popped this Ultima/HD wedge in the classified ads from a gentleman in Kenosha, Wisconsin. I had tried to get one of these a couple of times, but missed. It has the same platform that connects to the bottom of the base of the the forks, but then things get different. It gets more. It has a slow motion elevation adjust screw on the back, an azimuth adjust screw on the other side (don't know why I didn't take pictures of them), and a built-in bubble level that appears to be fairly accurate. In addition to those there is SPACE to set things on. That's always handy. 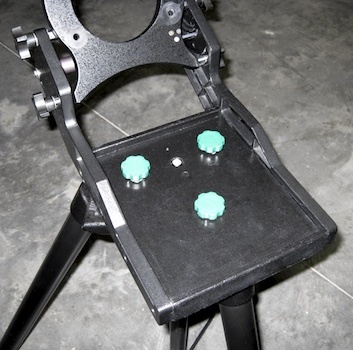 The same set of red knobs that I made for the other wedge to attach the forks to the wedge worked OK, since that part in this wedge was the same, but the knobs for attaching the base of this wedge to the tripod had to be longer. The ones for the standard wedge were 5/16"-18 1" long. These ones had to be 1-1/2" long. In addition I had to get some 9/32" thick collars to go on the bolts to make up for the small canyon that just a non-fancy cap head bold would sit down in. A slightly thick washer was also needed. 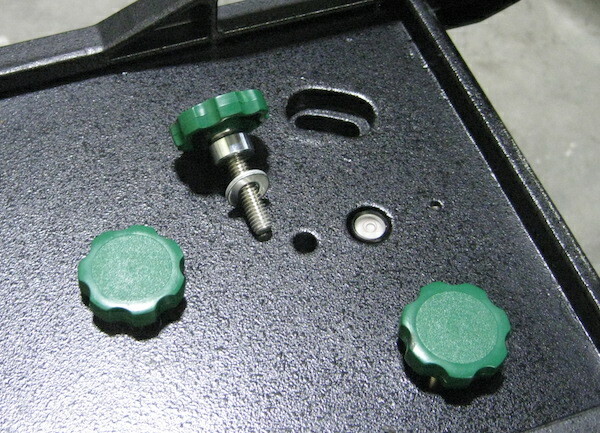 The collars have a set screw and stay attached to the bolt so there is one less thing to drop in the grass. Now we're talking astronomy! That looks much better. Over the previous weekend I was going to take the "new" scope for a spin, but instead of the weather being breezy and clear it was neither. While I put this wedge together it was clear, but a little too breezy. Of course it calmed down after sunset...this time. It's always a crap shoot.